Unable to read this email? Click here to view as a webpage. 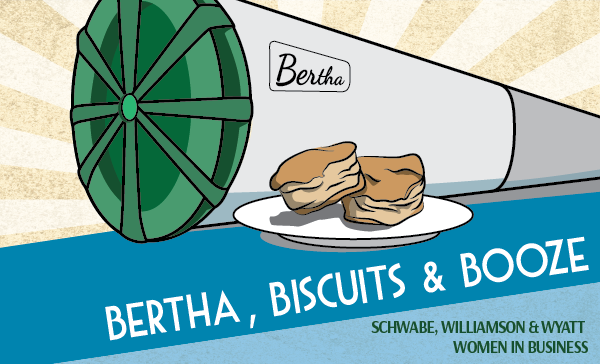 Join Schwabe, Williamson & Wyatt Women in Business for a fun evening networking with members of the female business community while learning about the world's largest tunneling machine, sipping locally made booze near the site of what will be the "new" waterfront, and snacking on biscuits. Named after Seattle's first (and only) female mayor, the 57–foot–diameter tunnel boring machine has had quite a life in Seattle. Hear from Seattle Tunnel Partners—the joint venture designing and building the new SR-99 tunnel—about Bertha and what may be ahead in Bertha's future. In addition to learning about how Bertha will change the waterfront, Copperworks Distilling Company will guide us through a tasting of their booze, something former mayor Bertha would have disapproved of back in 1924. This event is intended for informational purposes only and is not intended to serve as legal advice regarding specific matters. Attending this presentation does not establish an attorney-client relationship between you and Schwabe, Williamson & Wyatt. You're receiving this email because of your relationship with Schwabe, Williamson & Wyatt. Please confirm your continued interest in receiving email from us. You may unsubscribe if you no longer wish to receive our emails.